UPDATED: Sat., July 21, 2018, 7:27 p.m. 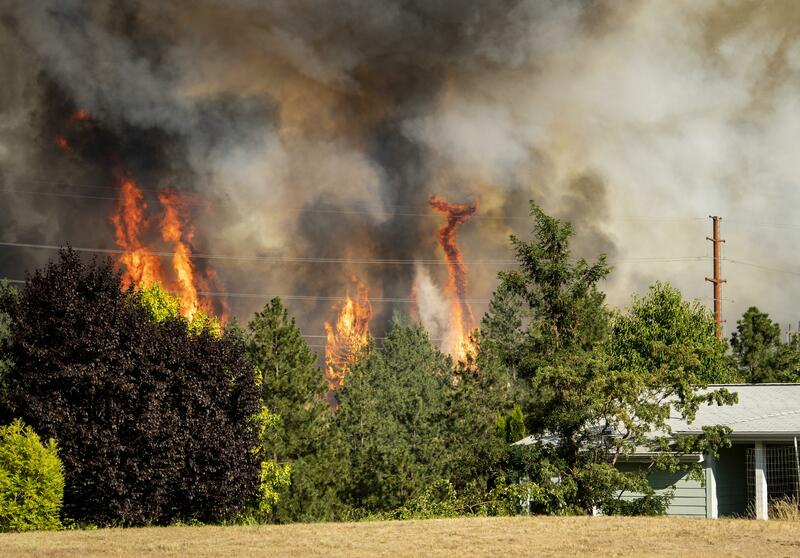 Firefighters have successfully contained the Upriver Beacon Fire, which led to hundreds of evacuations between North Spokane and Spokane Valley and contributed to smoky conditions this week. According to a Washington Interagency Management Team news release, multiple agencies and 87 personnel fought the fire, which burned 115 acres and damaged power lines. The blaze started Tuesday on private property on Upriver drive and burned three structures, Jeff Sevigney, Washington State Patrol Trooper and a spokesman for the interagency team, said earlier this week. The evacuation notices to the area around Upriver Drive and the road closures have been lifted, according to the release. The parks department had asked people to stay away from burned areas in Camp Sekani and Shields Park Climbing Rocks, but those areas are now open. The Upriver Beacon Fire and smoke drifting from fires in Oregon led to a haze over Spokane on Wednesday and Thursday. Conditions improved from moderate smoke risk, which can be harmful to vulnerable populations, to good conditions this weekend, according to the Spokane Regional Clean Air Agency air quality monitor. According to the release, the cause of the fire is still under investigation. In Central Washington, fire crews from around the state are fighting a 70,000 acre fire just west of the Cascades. The Department of Natural Resources tweeted that 300 personnel were assisting with the Boylston fire, which is burning near the Ryegrass rest area in Kittitas County, and crews are completing a line around the fire Saturday. Published: July 21, 2018, 4:53 p.m. Updated: July 21, 2018, 7:27 p.m.